Kite surfing is the latest extreme sport that provides an adrenalin rush to anyone who loves the outdoors. Learn how to kiteboard with the pros! Soaring through the air, 40ft off the water; carving up glassy, smooth water in only 15 knots of wind; riding a perfect 8ft break a kilometre offshore…this is kiteboarding, and its popularity is surging throughout the world with all types of people willing to give it a go in search of the ultimate adrenalin rush. 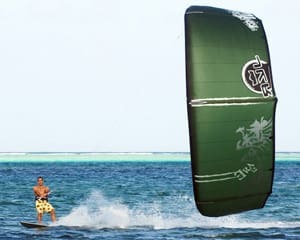 Combining traction kiting with windsurfing, wakeboarding, snowboarding and surfing gives you an adventure sport that is easy to learn, allows total freedom, and pushes the boundaries as to what really is possible on water. Kite surfing is the latest extreme sport that is providing an adrenalin rush to anyone who loves the outdoors. Spread over 3 sessions for the complete kite and board experience, this is our most popular course!! First day is mainly on the land but we do get you in the water bodydragging. On your second day will you be getting wet straight away and we introduce the board. All of our lessons are personal with a maximum of 2 students at a time. Kitesurfing is fun and athletic! Once you feel the freedom of kitesurfing over the waves you'll never turn back! We use the latest gear on the market, allowing for maximum progression, safety and security in a supportive learning environment. We are an IKO (International Kiteboarding Organisation) Accredited School who prides itself in creating a safe and rewarding learning experience. Kiteboarding lessons take place everyday between November and March as long as the weather, in particular the winds, are suitable. This experience includes 3 sessions taken over 3 days. Accommodation nearby is available on request. Note: As your lesson is controlled by the wind, it is possible that you may need to postpone your booking time.